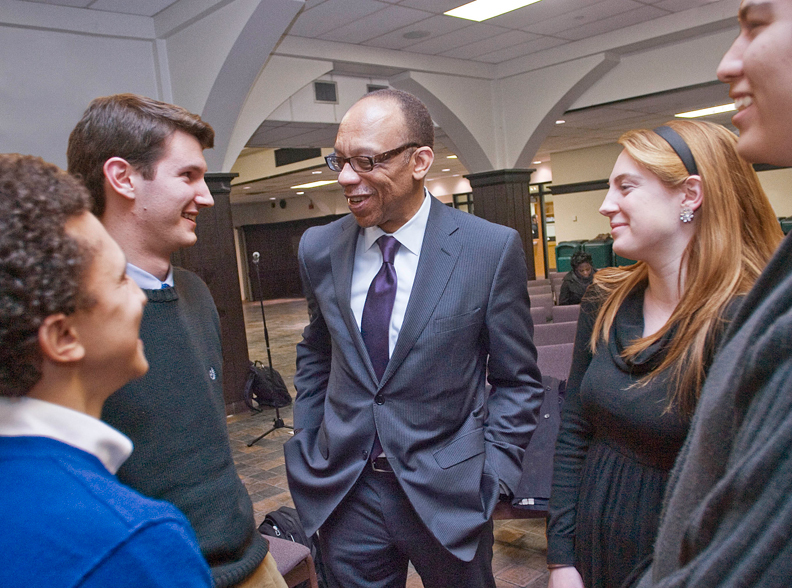 Washington Post columnist and MSNBC commentator Eugene Robinson spoke in Lyons Hall on February 22 about the changing demographics of black America. Robinson, who garnered a Pulitzer Prize for his columns on the 2008 presidential campaign, is the author of the recently published book Disintegration: The Splintering of Black America. He told an audience of some 80 students and faculty that although there is a significant cohort of wealthy and powerful black Americans, 30 percent of the country’s African Americans are what he calls “abandoned,” unable to climb upward because “the rungs of the ladder—the blue collar jobs—are missing.” Robinson urged students to pay attention to events unfolding in the Middle East as well as legislative budget battles in midwestern states, adding that “elections matter.” His visit was organized by College Democrats of Boston College, with support from the AHANA Leadership Council and Americans for Informed Democracy. It took place near the end of a four-week celebration of Black History Month on campus, marked by events ranging from a Gospel Showcase of dance, music, and drama to the AHANA Leadership Ball. Above, following his speech and a lengthy question-and-answer session, Robinson (center) talked with, from left, Talal Rojas ’11, Jayson Joyce ’12, Stephanie Rice ’13, and Kristoffer Munden ’11. This feature was posted on Thursday, February 24, 2011 and is filed under Featured Photo.